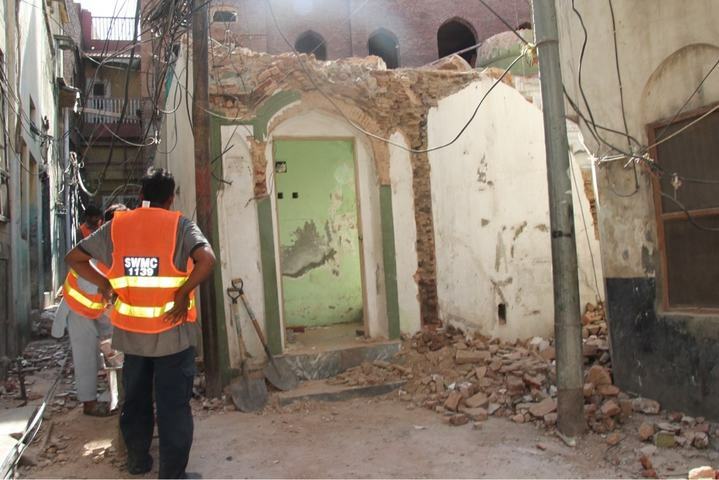 Jamaat-i-Ahmadiyya spokesperson Salim Uddin, in a press release issued on Thursday, condemned the demolition of the community’s place of worship as well as a historically significant building by “miscreants along with governmental administration” in Sialkot. “In the meantime, more than 600 miscreants chanting slogans joined in and started demolishing an Ahmadi worship place near the building,” read the press release, adding that the “vandalism” continued until 4:30 in the morning. The incident caught attention on social media when pictures and videos showing a “mob” destroying the religious site started circulating early Thursday morning. One video showed a man breaking a minaret with an iron tool. A separate video showed a man, who is said to be a leader in a major political party, thanking the district police officer, the deputy commissioner, religious parties and teams of the town municipal administration for their support in removing minarets — “which are a symbol of Islam” — from the place of worship. “The Ahmadi worship place and building vandalised by the mob possessed historical significance for the Ahmadi community and had been standing for more than a century,” the press release stated. According to the statement, the building had been “renovated a while back, after which the municipal committee sealed it”. “We are seeking legal action against [the attackers]. Vandalism of buildings by the governmental administration for the mere satisfaction of extremist forces without any judicial order only goes to demonstrate the fact that the civil establishment has given up in front of elements that use religion to seek their personal and organisational interests,” the statement regretted. The spokesperson demanded security for community’s worship places along with compensation for the damages, which he said ran into tens of thousands of rupees. He also asked that the miscreants be tried under the law. The local authorities, however, insisted that the building was demolished because it was an “illegal construction”. According to Akhtar, the illegal construction continued in violation of rules and the corporation therefore “took action last night and demolished the illegal construction”.